Dow Theory is a time-honored market analysis tool. Its name comes from Charles H. Dow, co-founder of The Wall Street Journal. Dow Theory holds that any lasting rally to new highs in the Dow Jones Industrial Average must be accompanied by a new high in the Dow Jones Transportation Average .... When the transport average lags, it can presage broader stock declines. Both [the Wave Principle and Dow Theory] are based on empirical observations and complement each other in theory and practice. Critics of the theory say it's no longer relevant. They argue that today's economy is less dependent on transportation and more on technology. But EWI's analysts say this historical indicator is still highly useful to investors. 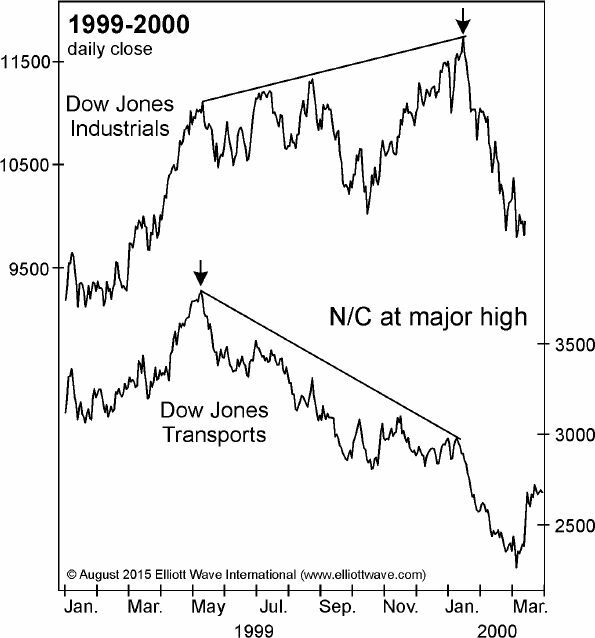 You'll notice that in 1999-2000, the transports topped about eight months ahead of the Industrials. Starting in January 2000, the Industrials slid some 40% through October 9, 2002. 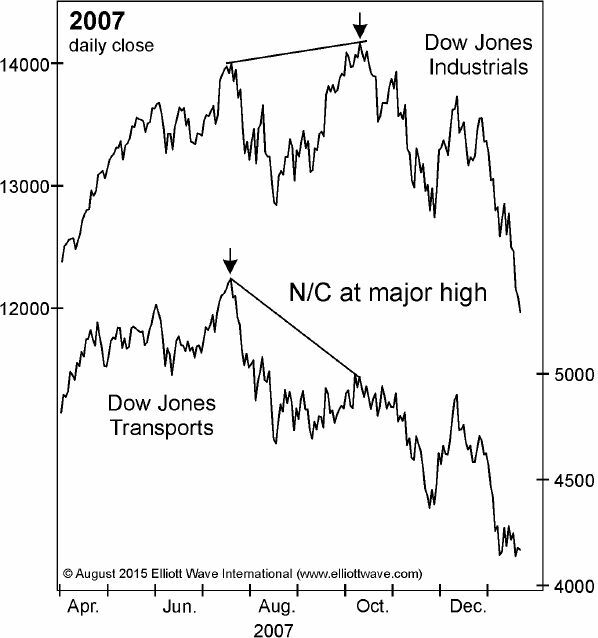 In 2007, the transport's peaked about three months before the Industrials. The 2007-2009 bear market was the worst since the Great Depression. The Dow Industrials lost 54%. A Dow Theory non-confirmation does not accompany every stock market downturn, but the historical record shows that it does attend the start of every big bear market. This article was syndicated by Elliott Wave International and was originally published under the headline How This Classic Market Theory Can Warn You of Big Turns. EWI is the world's largest market forecasting firm. Its staff of full-time analysts led by Chartered Market Technician Robert Prechter provides 24-hour-a-day market analysis to institutional and private investors around the world.